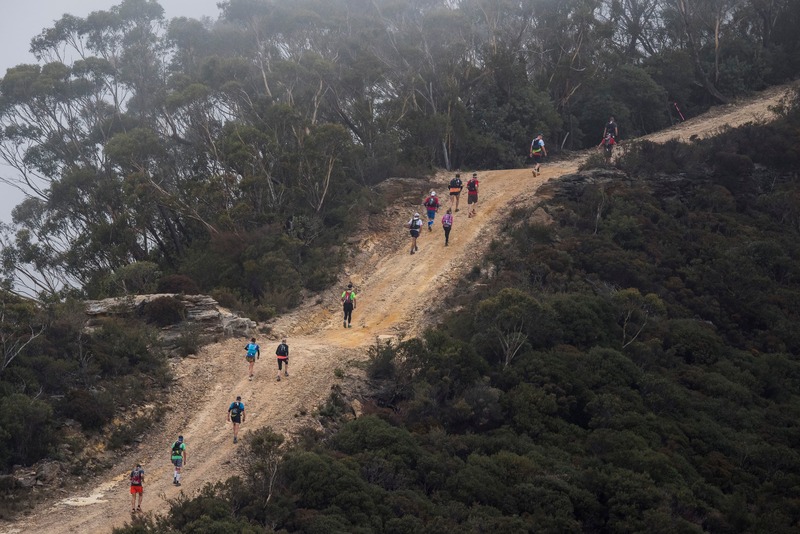 There was a feel-good start and a ferocious finish to the eighth edition of trail running epic The North Face 100 in the Blue Mountains today. 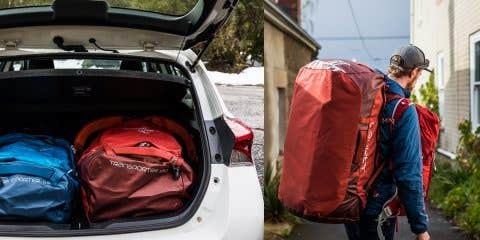 The 100km race and its sister 50km event attracted more than 2000 entrants, but it was a man from Nepal and a man from California who made things really special at both ends of the 100km classic. On a day with perfect conditions for racing, records tumbled and special memories were created. No-one who followed the first third of this year’s TNF100 will forget the excitement of seeing Nepal’s Purna Tamang bravely running at the front of the race just weeks after his country was devastated and his own home destroyed by an earthquake. Despite his disrupted training coming into TNF100, Tamang took the lead early and stayed there as the race dived into the Jamison Valley down the Furber Steps, climbed out again on the Golden Stairs and then charged down the Narrow Neck fire trail. 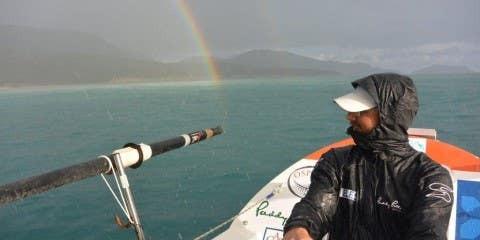 He reached the first checkpoint on Narrow Neck (10.5km) in 54 minutes, with a 37-second lead over second-placed Longfei Yan of China, with race favourite Francois D’Haene of France in fifth place, 50 seconds behind the race leader. 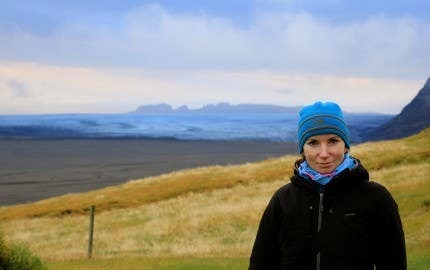 The first woman to checkpoint one was Cassandra Scallon of the US in 1:05:11, 42 seconds ahead of Australia’s Shona Stephenson, with Dong Li of China the third placed woman in 1:06:34. The favourite for the women’s title, US runner Amy Sproston, was fourth, 1:21 behind Scallon. The top 10 men charged through Dunphys checkpoint (31km) with less than a minute between them, but the steep climb to the top of Ironpot Ridge shook things up. Tamang was dropping off while four of the top runners – D’Haene, Dylan Bowman (US), Yun Yanquiao (China) and Julien Chorier (France) – took a wrong turn and missed 1.5km of the course. 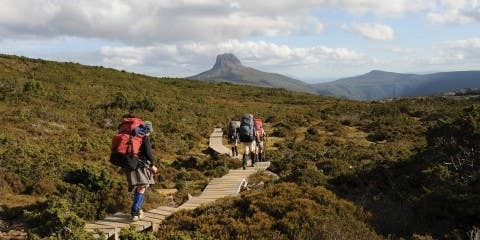 They were all handed a 15-minute time penalty when they got to checkpoint three (46km) on the Six Foot Track. Ironpot Ridge also saw Dong Li go past Scallon to lead the women. As the men climbed out of the Megalong Valley it was New Zealander Scott Hawker in the lead, closely followed by American Dylan Bowman, Longfei Yan and D’Haene. Walker was the first runner to make checkpoint four (57km) at the Katoomba Aquatic Centre in 4:46:05.Tamang was back to 17th at the same check point and getting a lot of massage work done to aching legs by his support team. 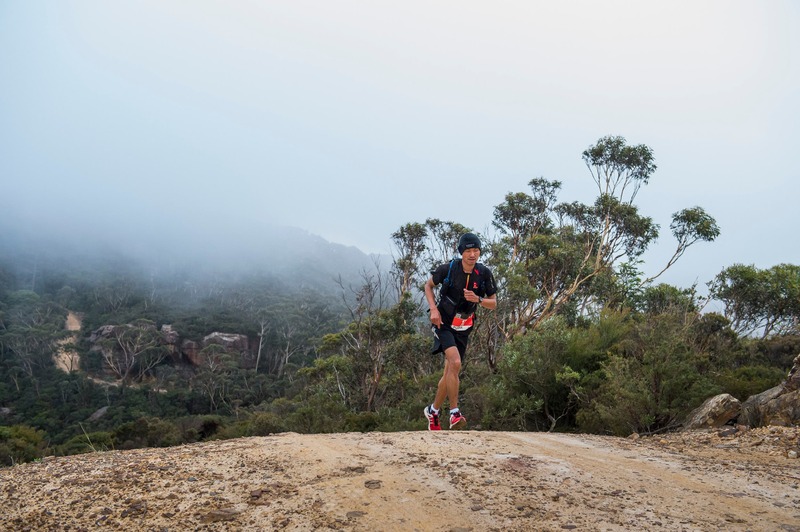 Heading east across the clifftops to Leura, it was Bowman, Longfei Yan, D’Haene and Hawker in a pack with a four-minute lead over the rest of the field at Gordons Falls. Dong Li had also forged a lead of nearly a minute over Scallon. 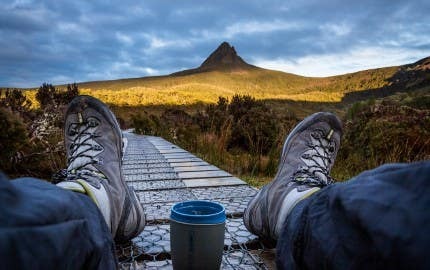 At Queen Victoria Hospital (78km), just before the plunge back into the Jamison Valley via Kedumba Pass, the leading pack had been cut to two. Bowman and Longfei Yan had a 2:31 lead over Hawker. 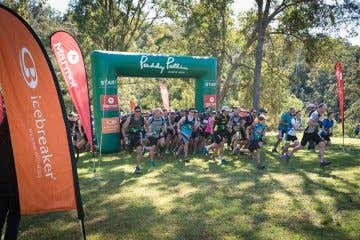 Ahead lay a traverse of the Jamison Valley and one last agonising climb up Furber’s 900 steps to the finish at Scenic World, with Bowman prevailing in a new record time of 8:50:13 – a whopping 40 minutes better than the record on the new course set last year by Stu Gibson (9:31:11). He was followed in by Hawker (8:51:35) and Yun Yanquiao (9:01:29), with Longfei Yan making it a great day for China by coming in fourth (9:08:50). 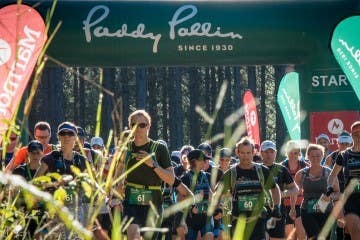 Being a Blue Mountains resident these days, Hawker was cheered at the finish like a local hero rather than a Kiwi raider. 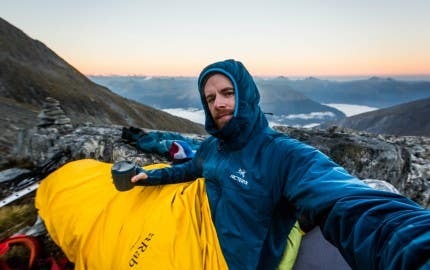 Bowman’s win comes on the back of his record-breaking first place in another Ultra-Trail World Series race earlier this year, New Zealand’s Tarawera 100. The crowd at the finish line was elated when he finished strongly in 20th place. 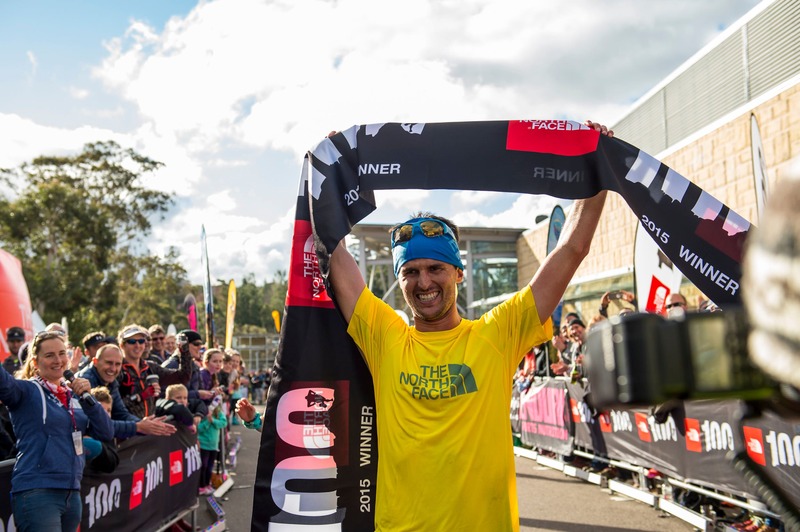 The best Australian was 10th-place Jono O’Loughlin (9:51:53) while popular Blue Mountains local and former TNF100 winner Brendan Davies was 17th (10:25:56). D’Haene, a previous winner of the Mount Fuji and Mont-Blanc Ultra-Trail World Series races, finished fifth (9:11:51). The day kept getting even better for the Chinese when Dong Li became the first woman home in 11:05:22. Sproston was second in 11:27:50. In the 50km race, New Zealand-based Lithuanian Andrius Ramonas streaked home to win in a course record time of 4:23:41, beating his nearest rival by 17:24. The first female, and seventh overall, was Australian Emma Rilen in a time of 4:59:05. “That was awesome, that was great,” she declared after smashing the course record by half an hour and beating her nearest female rival by 13 minutes. 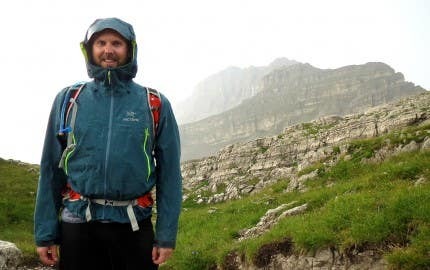 Trail runners can expect to see a lot more of Ramonas as he plans to stay three or four years in New Zealand while completing an intimidating Phd in exercise physiology, specialising in nutrition strategies for ultra-endurance running. 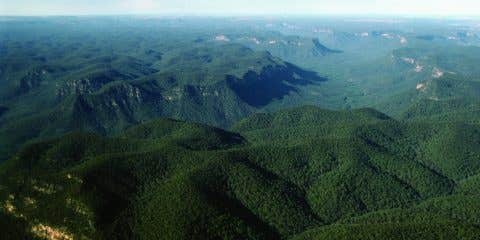 The event this year will host runners from thirty-five countries, proving both the race and the Blue Mountains are highly sought after worldwide. 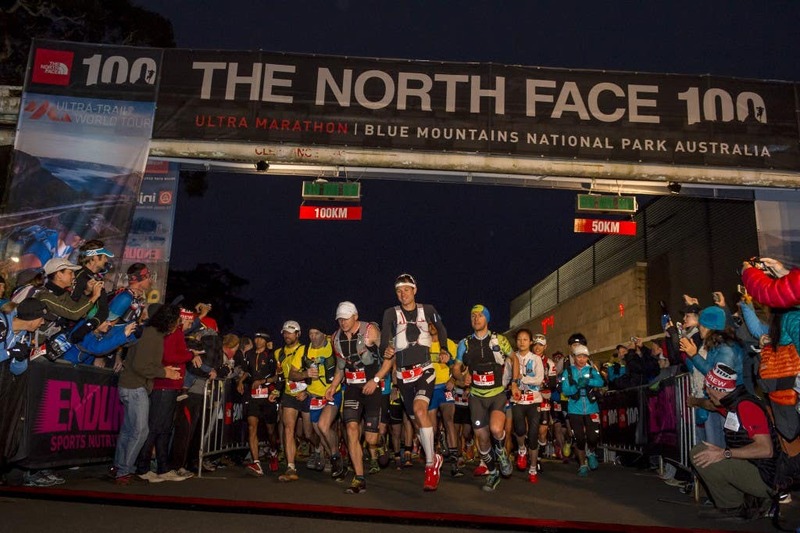 The North Face 100 is part of the Ultra Trail World Tour, one of ten of the most emblematic trail running races in the world. 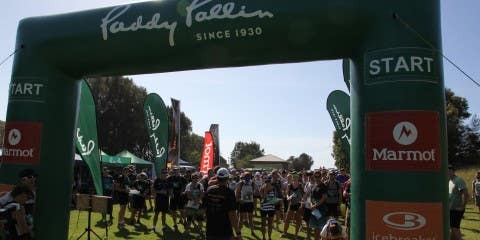 Drawing over 2000 participants and thousands more spectators and supporters, the race brings new life Katoomba. 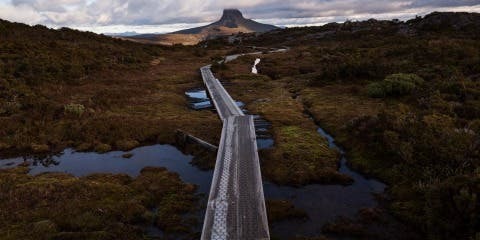 The challenging trail-run through sandstone canyons, eucalypt valleys, and breath-taking ridge top panoramas of the Blue Mountains will bring together a unique fusion of athleticism, environmental immersion, and self-fulfilment.